What is Happening to Sales Prices in Vancouver? Are Prices up or Down in Vancouver? It’s all anybody really wants to know, are real estate prices up or down? We already know sales are dropping significantly as I discussed in Analyzing Sales Drops Across The Board. I think it should give you a pretty good idea where the market is heading when sales are down and inventory is up. Sales to actives ratios are plummeting and months of inventory is stacking up, at least on the detached side anyways. You can read more about that in Mid September Market Update. Here’s the sales to actives chart. Going from 52% in March (anything above 20% is a sellers market) to 14% in August. Sales to Actives ratio drops from 52% in March to 14% in August. Early numbers show September sales to actives ratio will be even lower than August. But these numbers aren’t enough for some. Just the other day someone on Twitter told me average prices are up for September… Let me explain why that means nothing. Let’s look at 2008. Canada, and Vancouver prices somehow managed to basically dodge the huge financial crisis. 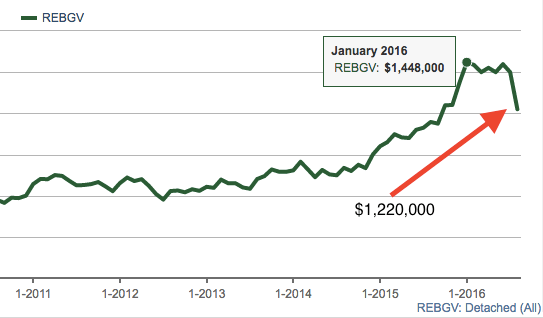 Prices managed to drop only 14% in 2008 for REBGV according the real estate boards benchmark pricing. Prices started dropping in mid 2008, right around when sales to actives dropped. 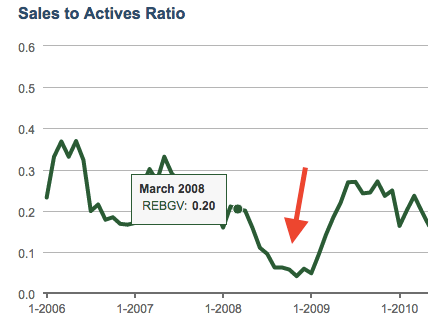 Sales to actives plummets from 20% in March to 4% in November 2008. How much did prices drop in 2008 when using average, median, and benchmark prices? Average sale prices peaked in February 2008 at $922,056. They hit bottom in November 2008 at $750,686. A 9 month decline that resulted in a 14% price drop. Average price drops 14% over 9 months. Because average prices fluctuate so drastically month to month to the average person you would barely notice any price change. But they’re there, believe me. Median price peak was not until May 2008 when it hit $719,500. Which then bottomed out in December 2008 at $619,000. The real estate boards infamous benchmark algorithm. According to the Benchmark, prices didn’t peak until June 2008. One month after Median and 4 months after average price. Their benchmark reports a 14% drop, and hitting the bottom of the market in March 2009! Talk about a serious lag. 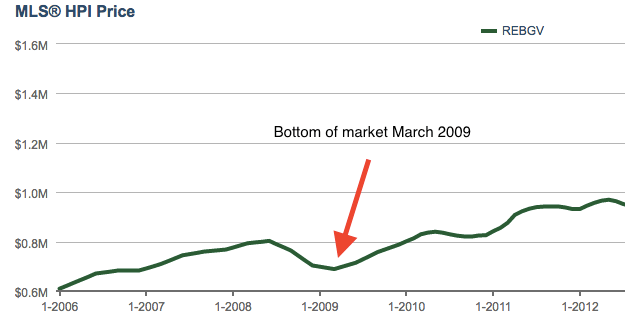 MLS Benchmark shows bottom of market in March 2009. Sales to actives ratio drops, prices follow. Average prices start, median follows, then benchmark adjusts. Average price peaks in January 2016. Does not take serious plunge until June. Median sales price also peaks in January, takes significant downward trend in June. Median sales price down 16% in August from it’s peak in January. Median sales price drops 16% since January. Benchmark takes it’s first decline in August 2016. It was the first time benchmark has declined since October 2013. Benchmark takes first drop in almost 3 years. This is truly remarkable. The benchmark, known for showing trends finally takes it’s first drop in almost 3 years. So how much have sale prices changed since it’s peak in January? 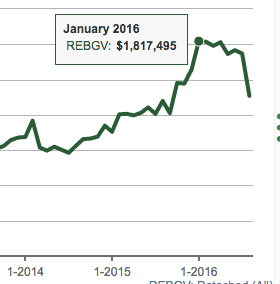 Average REBGV detached house prices have dropped 17%. Median prices have dropped 16% and benchmark dropped so little we’ll call it a wash. Although average and median fluctuate month to month you simply can not ignore the trend. Based on my conversations with many Realtors, they estimate detached house prices have dropped between 10-20%. Their consensus perfectly lines up with the numbers above. So, although average and median prices could potentially show a slight increase in September it’s important to remember average and median graphs look like a set of jagged teeth. They go up and down almost every month but there is always a trend. A trend that currently shows a 17% drop. Benchmark is just getting started.